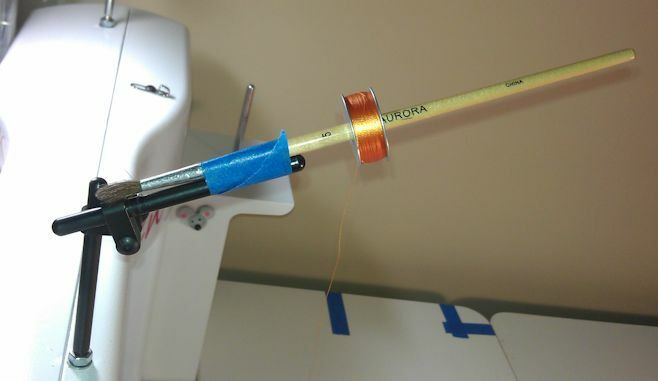 I had a devil of a time with a small spool of 100 wt Wonderfil Invisifil thread — it kept getting caught in the slot on the spool that secures the thread, or wrapping itself around the vertical or horizontal thread spool holder. It was the only spool of that colour that I had and it was perfect for the top stitching I wanted to do. But how to get it off the horrible spool and put it onto something that wouldn’t catch? Except the previous day I’d rigged up a temporary lighting system for my Sweet Sixteen 😉 Surely I could do the same for the bobbin so I could use it as the top thread? 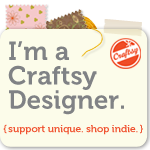 Off to the sewing room, the kitchen and the shed to see what would work. I came back with an artist’s paintbrush, a roll of painters tape, and a satay stick. Well, the satay stick wasn’t going to work as it was way too thin. But the paintbrush was an option — the bobbin spun nicely on it, until I set it up, when I found that the 100 wt thread just wanted to spool off the bobbin and get wrapped around the paintbrush. So that was no solution. The problem was that there was nothing to prevent the thread from coming loose from the bobbin and winding itself around whatever makeshift spool holder I had. I needed a cap of some sort… Just like on my domestic machine. My husband brought out a screwdriver that was the perfect diameter — my domestic sewing machine caps and felt pads fitted perfectly. It was then a matter of attaching the screwdriver to the machine with painters’ tape and off I went! 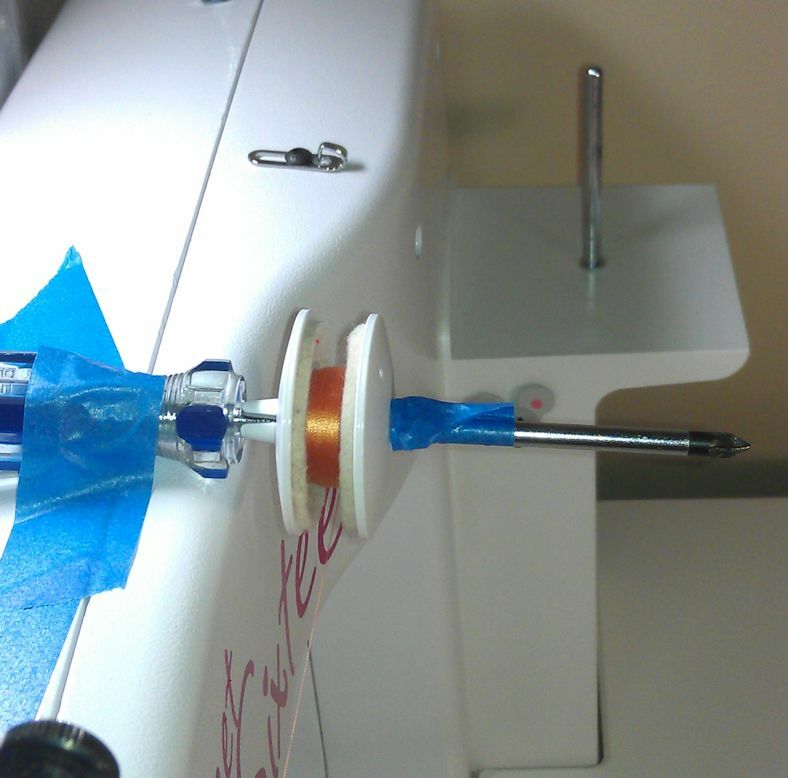 This solution was perfect — the felt pads and the caps from my domestic sewing machine kept the bobbin thread where it belonged, and the diameter of the screwdriver was such that the bobbin spun smoothly. 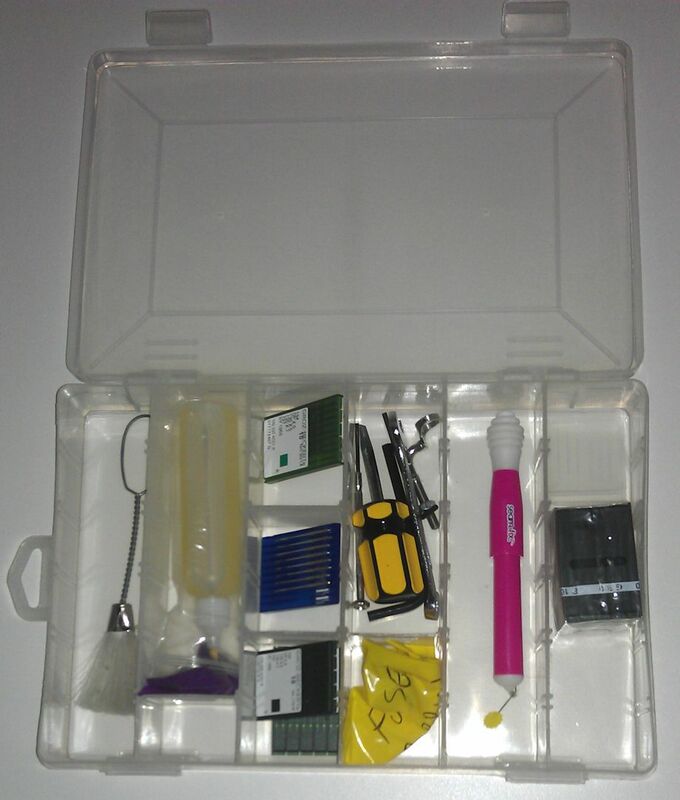 This option would not have been necessary if Handi Quilter had built these machines with slightly narrower diameter spool holders that would comfortably take thread spools and cones, AND M bobbins. Such a small design change would offer more thread delivery options to users. 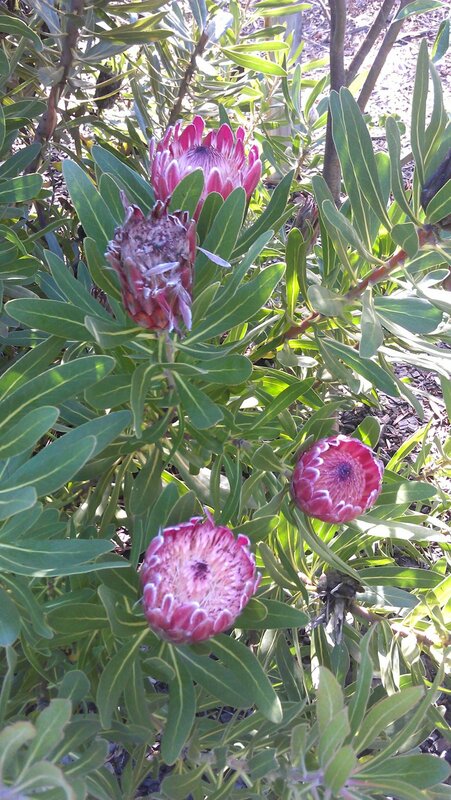 I have a few protea bushes in the garden, of at least three different varieties (one I know is a Pincushion protea). One of the bushes (tree?) is in flower at the moment. 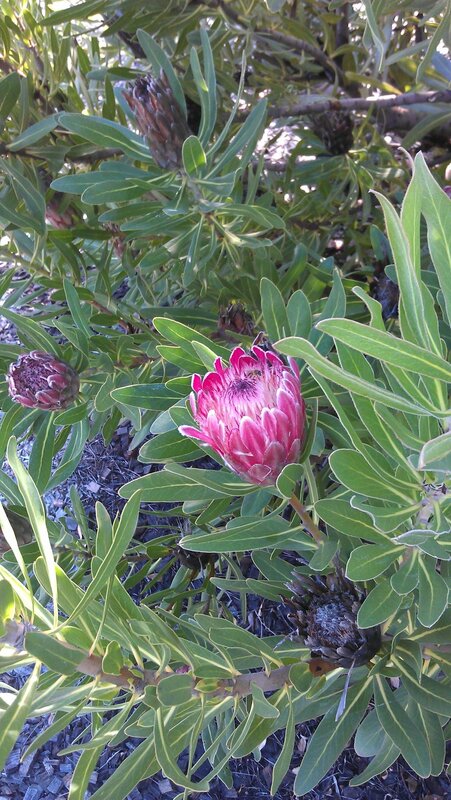 I know it’s not a King Protea, but it’s similar and has a large flower. Anyone know what variety it is? At a guess, the flower head is about 10 to 15 cm (4 to 6 inches) across. 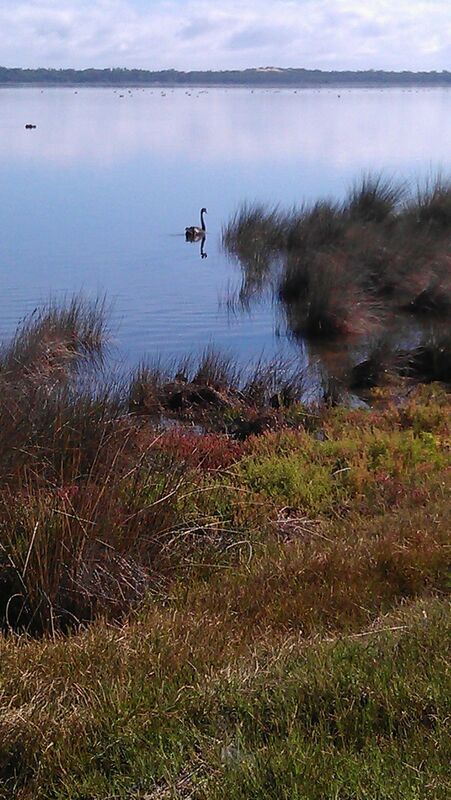 There are always black swans on the estuary close to us, but a couple of times a year there are hundreds, if not thousands, of them. These mass congregations seem to be about September and April, and are possibly related to nesting/mating and hatching seasons, though I haven’t confirmed this. 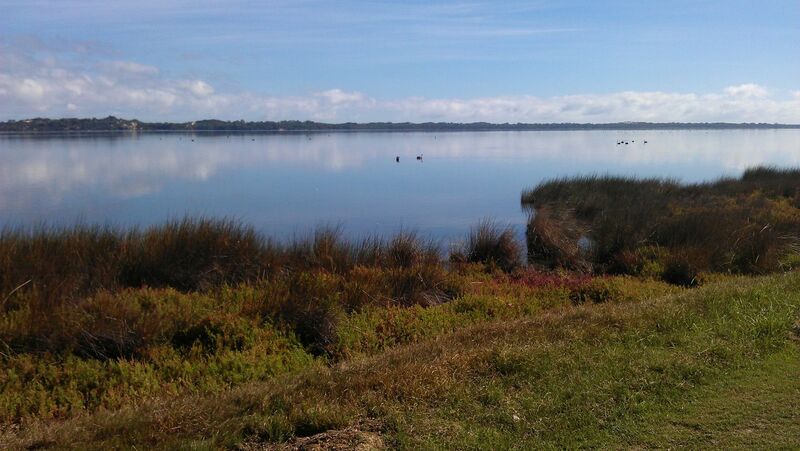 Mostly, the congregations are well out in the middle of estuary, but this year I’ve seen quite a few swans reasonably close to shore when I’ve driven into town (the road hugs the estuary for much of the way). And for the first time, I’ve even seen one (twice) on the other side of the road, near a natural (?) pond with bulrushes right next to a house. I suspect this bird is nesting there, though waddling across the road would be fraught with danger. Here are some photos I took with my phone the other day on my drive back home from the shops. None of the birds was really close to shore, but it was such a nice day and the estuary was looking so good, I wanted to take some photos! 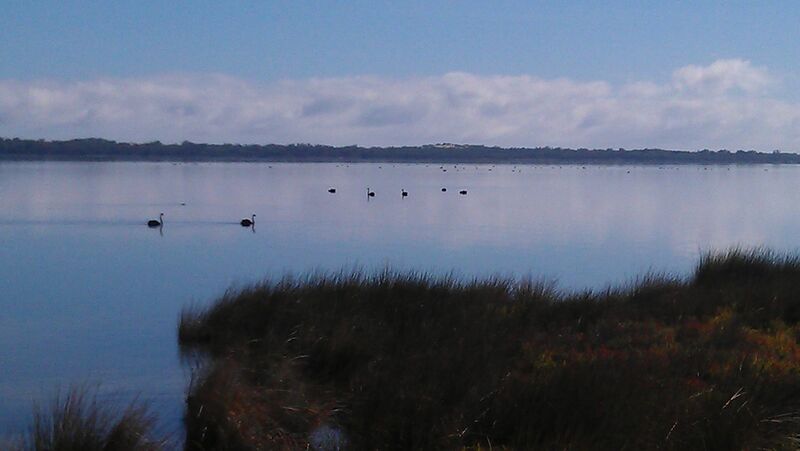 The black dots in the background are some of the swans — this is where they normally hang out. The estuary is about 20 km long, and there are swans along the whole length of it, so these pictures are only a tiny snapshot of some of the swans. Another light ring on my Handi Quilter Sweet Sixteen has started flickering… So, as I need to use my machine, I’ve turned the light off to stop the strobing effect. But there’s not enough natural light to see what I’m doing and the overhead lights are too yellow and just create lots of shadows. So I’ve placed a floor lamp with a white light on the right on the table, and I’ve ‘jerry-rigged’ an OTT Task Lamp on the left. 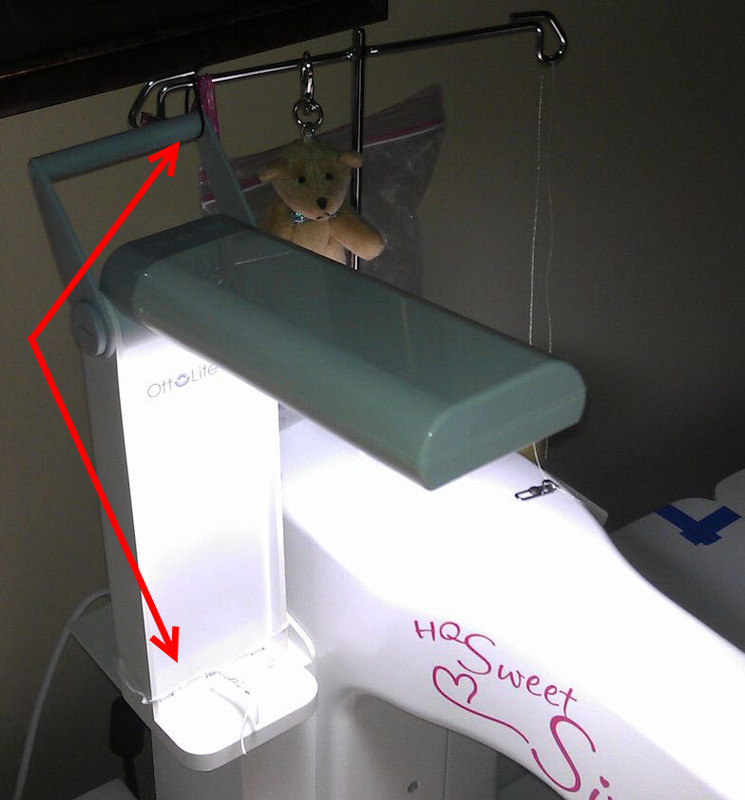 I used long twist ties to tie the OTT light to the spool holder on the left and to tie the handle to the left side of the thread mast. It’s not as good as the light ring, but it works! 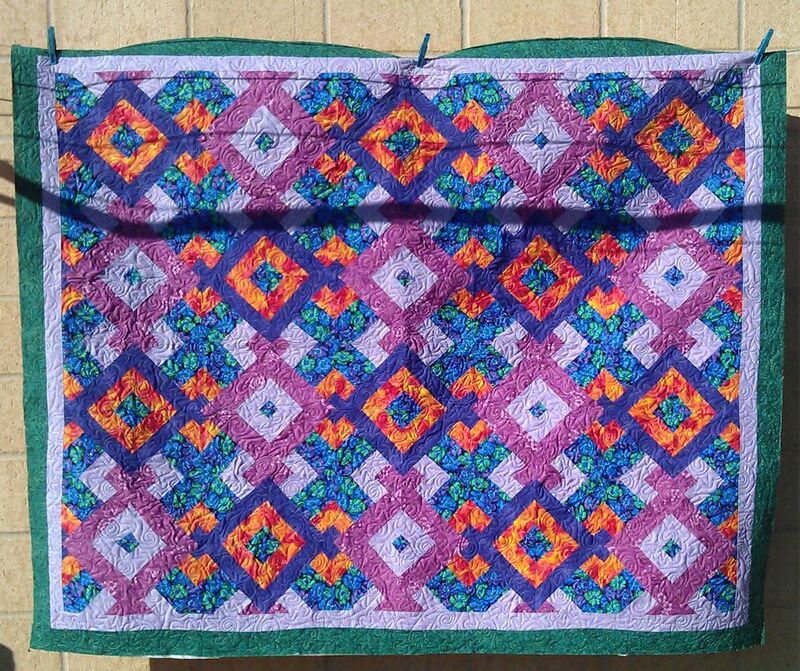 And then there are the wonky quilts… This one was the wonkiest I’ve tackled so far. 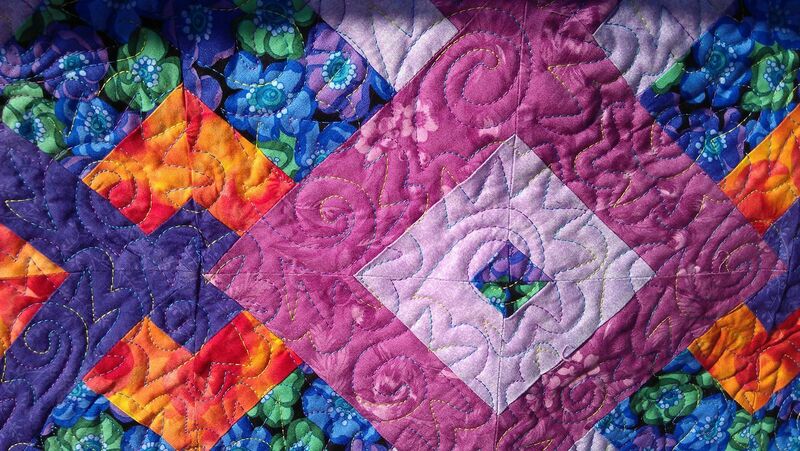 All those bias edges were wonky when sewn into the blocks, and the border was wonky. I chose a matching variegated thread in blues, greens and purples, using a rounded spiral morphing into spikes, then echoed with rounded hops. I have no idea what this design is called but it achieved the end result of flattening this very wonky quilt top. I love batiks, and I especially likes how the maker combined shades of batiks I’d never have thought to put together to make this HUGE quilt top (I think this is the biggest I’ve done on my Sweet Sixteen). 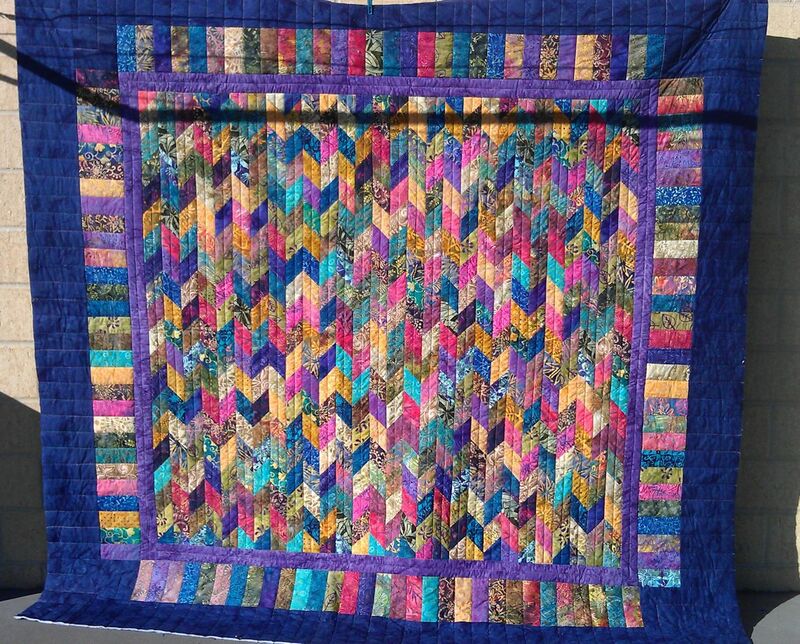 With the colour and the chevrons, and the overall linear movement of the quilt, I just had to stitch it with straight lines, a la modern quilting. I used a variegated thread with purples, greens, and browns/tans. And I used my Line Tamer ruler for the straight lines.